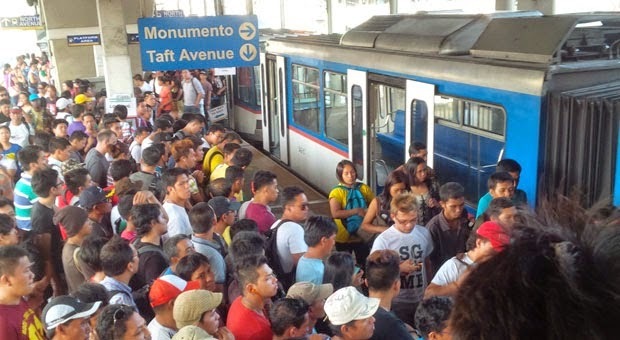 MANILA, Philippines - Sen. Grace Poe asked the Department of Transportation and Communications (DOTC) to defer the unnecessary and untimely Metro Rail Transit (MRT) fare increase effective January 4, 2015 amid unmet public expectations to improve even the basic facilities of the train system. "We must remember that a mass transport system such as the MRT is an essential government service. The fare increase is an added insult and an injustice to the suffering riding public whose very lives are put on the line everyday," Poe said. "The sorry state of the MRT brought about to a large extent by government mismanagement and ineptness cannot justify an increase. The government is obligated to maintain the subsidy until the system's services and safety are upgraded," the senator added. Based on the new fare matrices issued by DOTC on Saturday, rates for end-to-end trips in MRT-3 will increase to P28 from P15 (from North Avenue to Taft Avenue and vice versa); P30 from P20 in LRT-1 (from Baclaran to Roosevelt and vice versa); and P25 from P15 in LRT-2 (from Recto to Santolan and vice versa). The announcement came at a time when the MRT-3 and LRT Lines 1 and 2 are accorded substantial government assistance in the soon-to-be signed General Appropriations Act, which includes the amounts of P4.65 billion in subsidy, P7.94 billion for MRT rehabilitation and P4.67 in unpaid MRT taxes. The newly approved bicameral version of the Supplemental Budget, which will be immediately carried out in 2015, has the following items: P1.21 billion for MRT rehabilitation and capacity extension and P728 million rehabilitation fund for LRT 1 and 2. "While the MRT and LRT is in Metro Manila, the riders of these trains are mostly wage earners whose contribution to the national economy is far reaching and impacts productivity," Poe stressed. Poe led a public hearing of the Senate public services subcommittee on transportation on the pressing need to rehabilitate MRT's rail system, calling on officials and stakeholders to lose no time to discuss solutions to the MRT challenges that imperil commuters' safety. The senator explained, "The sub-committee in the last four months conducted three public hearings on the MRT issues. Almost all issues from the basic maintenance concerns to ownership of the kind of trains that we will procure in the coming years were all discussed. Considering that they have a date already to implement a new fare system, they should have volunteered it in the last hearing. But they did not. How could they be so insensitive to the millions of commuters and MRT, LRT riders?" "When was the last time they conducted a consultation? The last hearing the DOTC conducted in December 2013 does not satisfy the due process requirements as the situation then as far as safety and convenience are concerned have drastically changed to beyond worst. An issue like this deserves a fresh consultation from all stakeholders, particularly the MRT and LRT riding public," Poe said.